I sent feedback to the findingDulcinea folks yesterday, asking why no search box, and why no information on libraries? We are planning to have a search box up very soon. Ultimately we’d like it to include a “custom Web,” where it searches only the Web sites that we link to or otherwise recommend. However, developing this is taking a bit longer than we expected, so we are likely to put up an internal-search only box soon. The results will only be our content – not the content of the sites we link to. The former should be up in a week or so, the latter in 45-60 days. * Start by checking out library Web sites. They can be helpful in beginning your search, as they often have directories and lists of useful online tools and resources. An example is the New York Public Library, which has a comprehensive directory of librarian-selected and annotated links to sites with information on a variety of topics. Libweb can help you find a library Web site by the library’s subject or location. * The Online Education Database has an article entitled, “Research Beyond Google: 119 Authoritative, Invisible, and Comprehensive Resources,” that details Google alternatives ranging from the invisible Web to search engines specializing in things like art, government data, and transportation. We also reference several other library-based resources in this guide. Is there anything else you would suggest that we include ? This guide is the “mother” of all guides and thus is our most important one; as such, we are constantly revising and enhancing it. Cool. Love that I got a reply right away. I also told Mark that I would pass this along, so take this as your opportunity to help create the “mother of all guides” as he puts it. So, wander onto findingDulcinea and if you have any suggestions, pass them along! The folks at CommonCraft have created yet another terrific tutorial. Check out Blogs in Plain English. I have been searching for a while now for a Cross of Lorraine. I had one that I loved and wore often, both as a sign of my faith and as an indication of my background: the Cross of Lorraine is a particularly French symbol. I purchased it years ago at Bastille Days in Milwaukee, by a man who claimed it to be a French Explorer’s Cross, used by the men who traversed North America in the 17th and 18th centuries. I lost the cross and have been looking for its replacement ever since. Now, I’m a fairly skilled web-searcher. I’ve spent hours on and off looking for something similar to the one I lost, to no avail. Lots of “Magnum, P.I.” rings, but no pendant. Most Web users believe that the top results in a search engine are actually “endorsed” by the search engine, when in fact the results are determined by unfathomable algorithms. And, in fact, the most useful results may actually be on the second or third results page. Because of this, 85% of search users do not find what they are looking for on their first search try, and instead flail repeatedly at the search engine box, creating “Web search fatigue.” We cure this fatigue by reviewing and endorsing every site we select, providing users with the endorsed content they mistakenly believe they are getting with a search engine. On top of that, we write concise and informative annotations about each link we find, so you can know before you click whether the site is likely to be helpful to you. Many of the most popular Web-based news sources rely on the same wire services rather than employing the myriad of resources the Web offers, such as transcripts, reports, audio and video. Beyond The Headlines is more than merely another outlet for wire service headlines and the superficial reporting of breaking news. It strives to find primary materials and insightful analyses to allow readers to acquire something more valuable than information: knowledge. Netcetera is “the rest of the Web.” It’s a motley, yet organized collection of hand picked sites, articles and multimedia that our team of writers and researchers finds compelling. Netcetera spotlights what is entertaining and thought-provoking online, whether it’s old video footage of a great comedian, a virtual tour of a distant country, a resource-filled article on issues of interest, or a profile of an inspiring person. Netcetera, like the rest of our site, aims to bring fresh, thought-provoking information to our users daily. OK. I’ve seen a lot of sites, but I’m game to try another. So I clicked on shopping, then on the question “What stores are out there?” (All of the sections are headed by a question, which I find mildly annoying but whatever.) I then started down the list. First one, same results as I’ve had for weeks. One the second site, though, VOILA! A Cross of Lorraine, fairly large (2 3/4 inches), pewter, and really inexpensive! This was on a shopping site that I’d never heard of. What’s interesting is that neither Google nor Yahoo searches even found the site, even though the cross was very clearly marked. The bottom line is, rather than tilting at windmills (to continue the Man of LaMancha thread) I would give findingDulcinea a try. My one personal quibble is that there is no search box for the site. For instance, I wanted to find out what they had listed under libraries. I couldn’t find anything about libraries…..and since there isn’t a search box, I don’t know if there is a section relating to libraries without delving into every category they have on the site. (I looked under “books” and there’s a lot on how to buy books. Not a thing about libraries. Librarian of the Internet, my foot.) The site is still in beta, so perhaps that will be corrected. Regardless, give it a look. It’s always good to have another tool in the toolbox! I tried the music site Pandora a few times, and it was nice…but no classical. I got an email today from the Pandora folks requesting I try their station again….and low and behold, classical music! Yahoo! If you haven’t tried Pandora, it’s swell. You set up your own “stations” with selections from songs and artists you like. Then songs come on that are like those that you’ve chosen, and you can vote yay or nay as to whether you really like the selection. It’s pretty cool. They have also added genre categories, so you can add Baroque music, or Jazz, or Folk, or Hip Hop….whatever you’re into. If I remember correctly, they add a holiday station at holiday time, too. King Charles I once asked the chief librarian of the Bodleian Library in Oxford if he could borrow a book. He was told, politely, to get lost. A few years later, as the wheel of history turned, Oliver Cromwell also wondered if he might take a book away from the great collection, to read it at his leisure. He received exactly the same answer. Roundhead or cavalier, king or commoner, no one could take a book out of the library. Its books were not for lending, but for consulting. The library was a temple of learning, where scholars might come to read and learn. The books stayed put. But no longer. Today I can select any one of hundreds of thousands of digitised books from the Bodleian, including some of its rarest treasures, and read them on a computer screen. I can do this when the library is closed. I can do it without authorisation. I can do it from Antarctica, so long as I have an internet link. The Bodleian is one of the libraries being digitized by Google, and the author couldn’t be happier. His opinion is that the availability of these resources online will create a resurgence of interest in libraries. Most of the opinions I’ve read up until now tend to lean the opposite direction – that the online resources will make libraries obsolete. I rather like this version better. Through the internet, the library doors are suddenly thrown open to the widest possible readership, genuinely fulfilling Thomas Bodley’s aim to make collected books “available to the whole republic of the learned”. So far from driving readers from libraries and on to the internet, digital collections are likely to have the reverse effect. Just as televised football matches revitalised live football, so the chance to see and sample great literature on the web will encourage more people to go in search of the real thing. Libraries die when people forget what is in them: they thrive when we are reminded of their riches, and so far from eroding our physical contact with ancient books, the great online library currently amassing its collection will surely revive that relationship. There is still no tactile pleasure to compare with opening an old book: the gust of vellum and parchment, the knowledge of countless eyes tracing the page before you, the marginalia, the chance to hold some knowledge in your hand. The internet will never replicate that experience (just as no technology has been able to supplant the paper book, of which we are reading more than ever), but it can help, immeasurably, to lead us to it. From his mouth to God’s ears, as my grandmother would say. What a refreshing take on the digitization of library materials! Perhaps, instead of fearing this new technology, we should embrace it as a chance to show off the wonders available at libraries. I’ve been hearing for a while now about the One Laptop Per Child program, wherein you purchase a laptop for a child in a developing country for a very low price. They now have the Give One Get One program, where you can get one for yourself and one for the aforementioned child. Sounds good on the surface, but I have a few questions. If they don’t have internet access…..then why a laptop? There’s the cool factor, of course. But how about good teachers and a boatload of notebooks and pencils? I’m seeing the same trends in the public schools in this country, where one bond question after another is being voted upon by communities who are being told that their children aren’t learning because their buildings are shabby. Uhmmm…..it’s really nice to have new, spiffy stuff but it really has little to do with learning. As the product of less-than-pristine old Catholic schools, my education was just fine, thanks. Better than fine, in fact. This is not too far from the current hoo-ha in the library world over all things 2.0. Granted, a lot of the technological toys associated with 2.0 are cool and may give your library an edge with your patrons. But the reality is that good old-fashioned library customer service and a terrific collection go a lot farther to endear your patrons than IM reference. Let’s all take a deep breath and focus on why we’re here and what we’re doing….and try not to get so sidetracked by the shiny things. We finished the weekend last weekend in Milwaukee, celebrating my brother Tom’s wedding to Ekaterina. 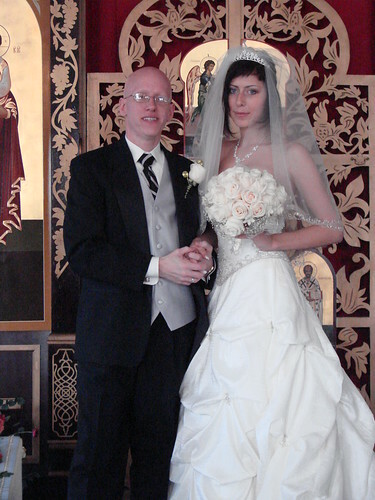 Katya is from the Ukraine, and so the wedding was at the Russian Orthodox Church in Milwaukee. Small, but beautiful, with amazing icons. Katya looked incredible. The ceremony was entirely sung (chanted, really) and was probably what a Roman Catholic ceremony sounded like 1,000 years ago. At one point, Michael and I held crowns over Tom and Katya’s heads for what seemed like an hour. (It was probably 10 minutes.) Now, I’m 5 feet tall. Probably 5’2″ in my heels. Katya is a good 5’9″, and with heels was 5’11” or so. 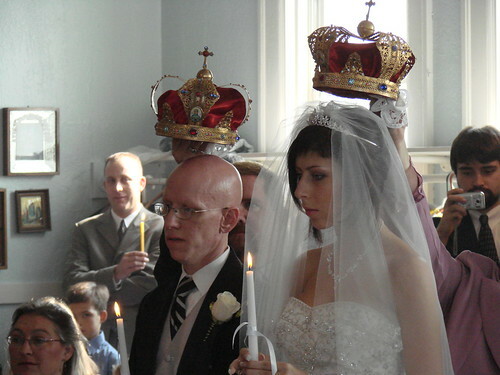 As you can imagine, holding a crown over her head was a bit of a stretch for me…..good thing she wasn’t one inch taller! 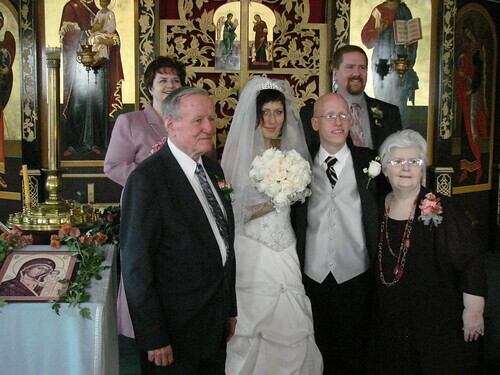 Afterwards, we took a few family photos and then headed to a local Polish restaurant for a luncheon reception. A lovely day was had by all. Welcome to the family, Katya.